Here's the second installment of my Songs of the Civil War Era blog rerun. "Tenting Tonight" is the first song I'm going to teach the 5th graders next week, and I hope it will set the stage for the history they're learning this year. I recently received some mp3s of my Songs of the Civil War Era concert/lecture at Bowdoin College, so for those of you who missed it, I'm going to post a song each Wednesday for the next three weeks. 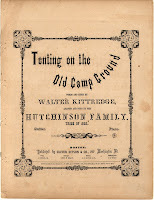 The first is "Tenting Tonight on the Old Campground," and you can listen to it by clicking on the player below (if you're on Facebook or the like, and can't see the player, try accessing it directly from my blog).